The keys to better business from a thriving group of business owners—the Amish. Business can be discouraging. According to US Department of Labor figures, only 44% of newly-opened firms will last four years. Amish firms, on the other hand, have registered a 95% survival rate over a five-year period. And, in many cases, those businesses do remarkably well-as Donald Kraybill writes: "The phrase 'Amish millionaire' is no longer an oxymoron." 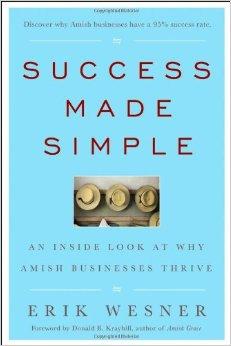 Success Made Simple is the first practical book of Amish business success principles for the non-Amish reader. The work provides a platform of transferable principles-simple and universal enough to be applied in the non-Amish world, in a wide variety of business and management settings. Learn how to develop profitable and fulfilling enterprises as Amish explain how to build fruitful relationships with customers and employees, prosper by playing to strengths, and create an effective marketing story. Includes interviews with over 50 Amish business owners outlining the role of relationships in business and the importance of the big picture-taking in long-term goals, the welfare of others, and personal integrity. Offers ideas on practical application of Amish business practices to non-Amish businesses, with bullet summaries at the end of each chapter reviewing the most important take-away points. With a focus on relationship-building and the big picture, Success Made Simple offers business owners everywhere the tools for better, smarter, more successful enterprises.